FEATURE: (7.31.07)-- July 2007... it's taken roughly 30 years to get to this point. Apple shares are at an all-time high yet again, the most revolutionary product released-to-date is the iPhone, and the fifth iteration of the big cat "Mac OS X" is due out in the fall. With all the high tech, high speed, high(er) capacity Mac toys we have today, it's hard to believe what we were doing, using, and drooling over just a little over a decade before... 12 years to be exact. Roughly the amount of time it took to get to the 30-year midpoint... give or take (give) a few years. In a classic edition of Macworld magazine from July 1995, the front cover story was, "The Mac's New Face: Leaner, Meaner OS to Derail Windows 95." We were still using System 7.5 and Vista was not Microsoft's answer to Tiger, but the newest UMAX brand 24-bit color flatbed scanner. On Microsoft itself, the Justice Department was also trying to stop Redmond, WA, from a $2 billion merger with software maker Intuit (creators of QuickBooks, TurboTax, etc.) because it would be, "anti-competitive." Some things just never change. The computer you may have been using was not Intel-based. (If it was, you were not a Mac user!). You might have been using a top-of-the-line PowerMac 8100 with 16 MB of RAM, a 2 GB hard drive, and a "blazing fast" CD-ROM drive... all for only? $4499. If you wanted an external CD burner, you only needed to add $1695. No, the dot's not in the wrong place. And there was no Apple Store to buy your computers from. It was mail order, or to superstore CompUSA, the only Apple hardware seller at the time in a nation-wide chain. (There were 83 stores across the nation, which would grow over time, but ironically, shrink again in 2006). Speaking of dots, as in "dot com," Apple was just debuting its online tech support unit in tandem with its "eWorld" service (kind of like today's ".Mac" and yesterday's answer to America Online for the Apple community), and Macworld magazine themselves were more focused on print than their online division. News broke first in the magazine. 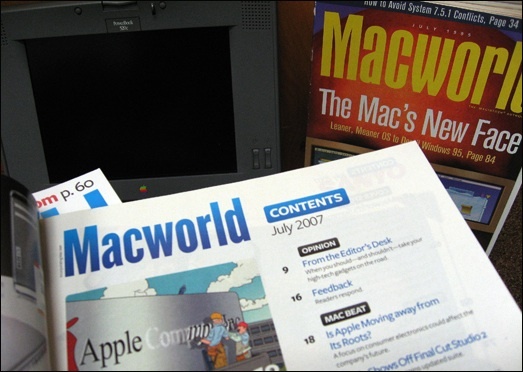 (Today, Macworld is half as thick as it used to be, and--no offense to Macworld--news that appears on their front cover and inside the magazine is already old because of the internet). Going online was a luxury and broadband wasn't yet a household thing. We were still using modems to get online at high speeds of 28.8 Kbps. In fact, it seems everyone got their first taste of the internet through America Online (now just "AOL") and almost every site had their own "Keyword" that was one or two words you typed in to go directly to a site. iPhone? Forget it. And you're complaining about the $499 price tag for an iPhone that you only want to use as a really neat iPod. (And there was no iPod then either). For only $469, you could get a superfast fax modem PC card to put in your PowerBook's (LC-based) PCMCIA slot. It had voice capabilities, let you fax, and also record calls like an answering machine. What, no calamari and directions to the restaurant? No movies or music? (Nope, sorry! ).